The ten men of Leicester City showed grit, fight and organisation to secure a sensational 2-1 victory at Turf Moor. After just four minutes, Harry Maguire was shown a red card after he clumsily clipped the heels of the onrushing Johann Berg Gudmundsson who was clean through on goal. Burnley were unable to really impose themselves on a ten-man Leicester, who grew in confidence. James Maddison was brought down on the edge box by James Tarkowski and the 22-year-old picked himself up to score a sensational free kick in the 33rd minute. Leicester's talisman Jamie Vardy missed a big chance to make it 2-0 and the Foxes paid the price. Seconds later, Charlie Taylor cut the ball back to youngster Dwight McNeil who smashed past Schmeichel despite the goalkeeper getting a hand to the ball. With just under 20 minutes to play, Sean Dyche was left frustrated after the referee did not give a penalty when Charlie Taylor seemed to be tripped by Wilfred Ndidi. Horror struck the Clarets with just five minutes to play. Having been pushing for the winner, Leicester captain Wes Morgan headed home from Youri Tielemans' ball. Burnley are in severe danger of being relegated and went into the game in 17th place in the Premier League, just two points off the bottom three. 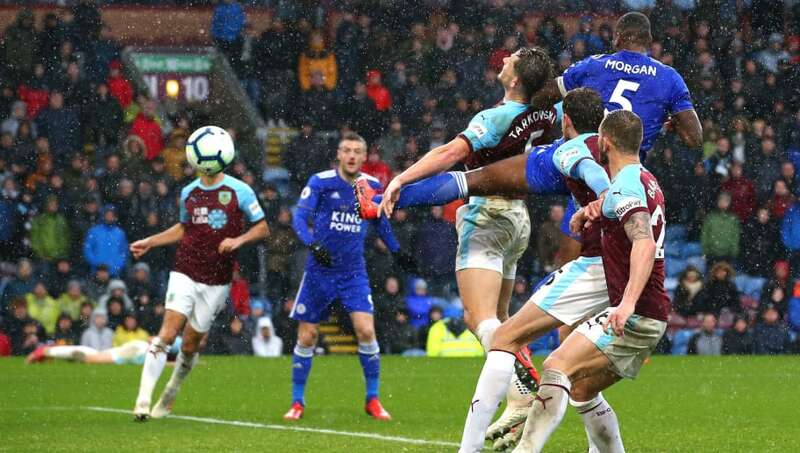 The onus fell on the Clarets to pick up a precious three points after Leicester went down to ten men after just four minutes. Sean Dyche would have wanted to make Turf Moor a fortress for the last stretch of the season and his side did not panic, levelling the score before half time through impressive youngster Dwight McNeil. It was all about game management for the Clarets, as they could not afford to lose the match and ultimately had to win it given their man advantage. But when chasing the winner, disaster occurred when they went 2-1 down with little time remaining. The result leaves Burnley two points above 18th placed Cardiff City but having played a game more than most teams around them. Starting XI: Heaton (5); Bardsley (5), Tarkowski (5), Mee (6), Taylor (7), Gudmundsson (7), Westwood (5), Cork (6), McNeil (8*), Barnes (5), Wood (5). Substitutes: Crouch (6), Brady (5), Vydra (N/A). 19-year-old Dwight McNeil has burst on the scene this season and put in an impressive performance once again. The young, English winger produced a smart finish following an exchange of passes with Charlie Taylor. Dwight McNeil's sweet strike ensures Burnley are level with 10-man Leicester City at half-time, Harry Maguire having been sent off. McNeil was threatening throughout the match and should have had an assist to his name after he expertly picked out Chris Wood who missed from point blank range. His performance certainly reflected his deserved call up to the England Under-20 squad. The Foxes are sitting comfortably in tenth place and a win would have seen them jump above West Ham to ninth in the table. New manager Brendan Rodgers was looking to build on his first win as Leicester manager against Fulham. Harry Maguire's early red card caused a complete reshuffle after just four minutes, but Leicester adjusted well and were worthy of their 1-0 lead courtesy of James Maddison. Pegged back to 1-1 before half time, it was always going to be difficult for ten-man Leicester who will still be hopeful for finishing in seventh place ahead of the likes of Wolves. Rodgers' side showed resiliency and organisation despite being at a disadvantage for nearly the whole match. Having held out throughout the second half, captain Wes Morgan who replaced Demarai Gray after four minutes scored the winner in a sensational away result. Starting XI: Schmeichel (6); Pereira (6), Evans (7), Maguire (3), Chilwell (6), Ndidi (7), Gray (4), Tielemans (7), Maddison (8*), Barnes (6), Vardy (6). Substitutes: Morgan (8), Fuchs (6), Mendy (6). Another young English talent, creative midfielder James Maddison produced a moment of real quality – just what a side with ten men needs. His direct play earned the Foxes a free kick which he sublimely put past Tom Heaton, who got a hand to the shot but couldn't keep it out. In firing home the set piece, the former Norwich man became the first Leicester player to score two direct free kicks in a single Premier League season. His moment of quality proved vital in a great win for Brendan Rodgers' men. After the International break, Burnley host high-flying Wolves at Turf Moor before travelling to the Vitality Stadium to face Eddie Howe's Bournemouth. Sean Dyche will see both matches as chances of picking up points if his side perform. The Foxes return back to the King Power Stadium in two weeks time to host Bournemouth in a mid table clash. Brendan Rodgers' side then travel to bottom of the league Huddersfield, where almost every side is expected to pick up three points.